It used to be that a ripe strawberry was a red strawberry, but things have moved on and there’s a lot more variety in strawberries these days. White strawberries, in particular, are becoming more common, and they offer up a challenge in terms of deciding when they’re ripe. 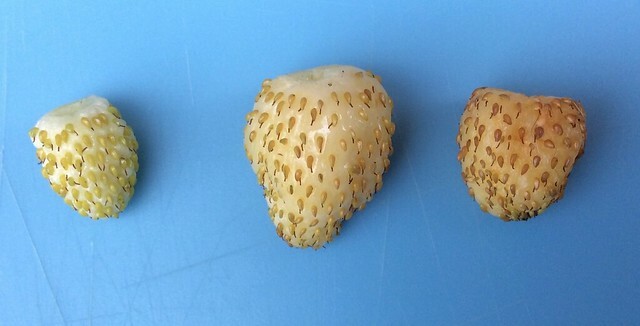 Ripeness for white strawberries is determined by size, fruit colour and pip colour – but there are differences between different types and varieties. Some have green pips that turn red when the berry is ripe, for example. I’ve been growing white alpine (and wild) strawberries for a long time now, and I find that final fruit size can vary, even on one plant. The image above shows three strawberries from one plant – unripe, ripe and overripe, from left to right. I’m getting pretty good at spotting the obvious ripe fruits from a distance, which prompts me to go foraging under the leaves to find the hidden ones. Unless you have a lot of plants, you won’t get much fruit in one go – this is a perfect plant from which to snack whilst gardening, but some do make it into the house. I turned the latest batch into gooseberry and strawberry compote, which we’re stirring into yoghurt. Now we know! How do white strawberries taste? Better, different, same etc? Well… people tend to say they taste a bit like pineapple, but I don’t make that association. They’re zingy and fragrant, and they are strawberry-like, but not the full-on strawberry flavour you’d get from a red variety. I think a lot of the strawberries we buy tend to be mediocre (commercial varieties bred for anything but flavour, harvested early to ripen on the way to the supermarket shelf, etc, etc) and they are often disappointing. White alpine strawberries are a big step up from those! I’ve never been much of a bubblegum fan 😉 but they do have that ‘candy’ flavour. I haven’t really noticed a smell while they’re on the plant… I will have to take a sniff! Great read, I don’t grow white strawberries at the moment but a friend of mine does and I had the please of trying some. I agree, I think they have a subtler taste than a red strawberry but it is more candy like. Similar to pink grapes. Ooh, interesting analogy, thanks Helen!